1.In the first row, the beads are added after the chain stitch and held there while working the shells. The beads are worked on the shells in the second row. Alternate shell chains are beaded in the third row. Two beads are added to the shell chain stitches in the third row. 2.Shell chain stitch with three beads and single bead are alternated in the first row. Shell chain stitches are worked with three chains and the middle chain is beaded in the second row. The shell chain stitches pass through beads in the third row. 3. A bead is worked first, and the chain stitch goes around the bead, this arrangement is repeated in the first row. The chain stitches are worked with two beads in the second row. The open version of shell chain stitches are worked with two beads in the third row. 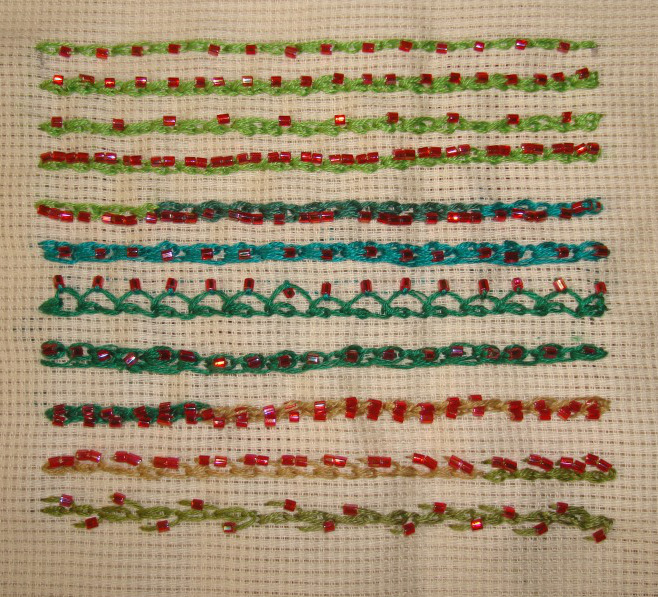 Open shell chain stitches worked alternatively on both sides with beads in the last row.